It's one of the last holdovers of the Cold War standoff between the U.S. and Russia: the treaty BARRING THE TWO SIDES FROM HAVING nuclear missiles THAT CAN reach targets in Europe on short notice. But now the Reagan-era Intermediate Range Nuclear Forces Treaty -- known as the INF -- is HANGING by a thread. On Friday, the Trump administration formally notified Russia it plans to withdraw from the INF treaty, over what it says are Moscow's flagrant violations of its terms. 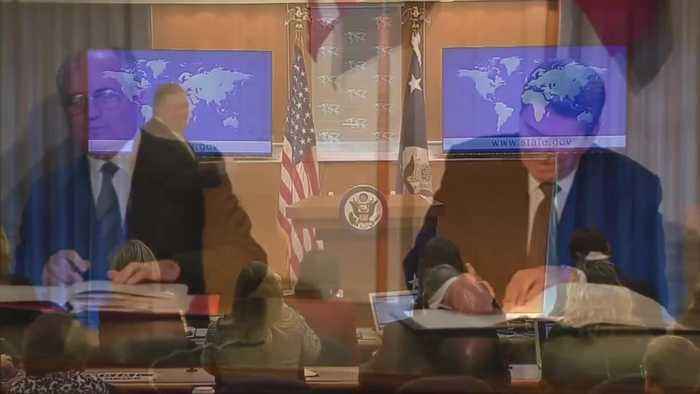 That word delivered by Secretary of State Mike Pompeo. (SOUNDBITE) (English) U.S. SECRETARY OF STATE MIKE POMPEO, SAYING: "Russia has jeopardized the United States security interests and we can no longer be restricted by the treaty while Russia shamelessly violates it. If Russia does not return to full and verifiable compliance within the treaty within the six month period by verifiably destroying its INF violating missiles, their launchers and associated equipment the treaty will terminate." This is the missile Washington says violates the treaty. Russia denies it is violating the treaty. It even staged an elaborate televised demonstration last week attempting to prove it. The U.S. says the system isn't compliant because of its long range. And has accused Russia of destabilizing global security by refusing to destroy it. Moscow maintains that Washington invented the violation in order to exit the agreement - something that would allow the U.S. to develop its own new missiles. In a statement before Pompeo's announcement, NATO said it would "fully support" the U.S. withdrawal notice. Last-ditch talks in Beijing failed to resolve the impasse, but with six months until the withdrawal goes into effect, President Trump on Friday said he was ready to engage with Russia on arms control negotiations. A spokeswoman for Russia's Foreign Ministry also on Friday said Moscow was ready to maintain a dialogue about the treaty.